You've got to hand it to the ancient Romans. Not only were they the first to invent concrete, they also discovered—way back in first-century B.C.—that by pouring concrete into molds they could mimic the ornate architectural details of carved granite or stone—with much less time and effort. Classic Roman monuments such as the Coliseum and Pantheon were among the first structures to incorporate architectural elements cast in concrete. This early artificial stone conceived by the Romans gave birth to modern-day architectural precast concrete. Through the years, concrete artisans have capitalized on Roman ingenuity by fine-tuning mix designs and moldmaking techniques, taking cast stone to a new level of quality and aesthetic perfection. Architectural precast concrete is also about as durable as natural stone, and is a much cheaper alternative. Architectural elements cast in concrete offer all the beauty of natural cut limestone, granite or marble, but permit much greater versatility in color, finish and detailing. 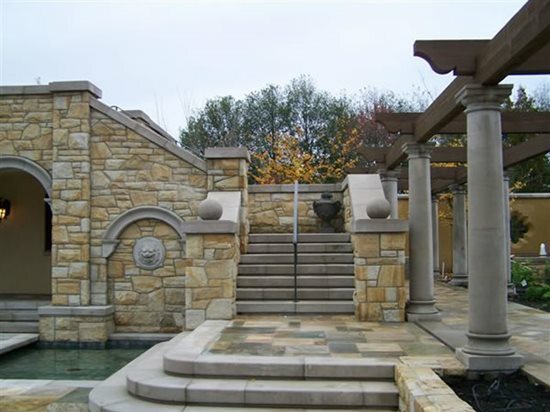 This unlimited design flexibility has made concrete a popular substitute for carved stone for all types of exterior and interior accents such as columns, balustrades, door and window surrounds, pool copings, wall caps, stair treads, sill caps, and more.